Set of four nesting cups. Each cup sports print and raised Braille on the handle. Made of durable, white plastic. Pouring spout adjacent from the handle helps in measuring liquids. Larger cups have no-skid rubber ring on the bottom. Truth be told, store-bought goodies are usually pretty yummy, but they are simply no substitute for hardy home baking. Many folks avoid making their own desserts, however, because of all the scooping and measuring involved. Well, avoid no longer ... This brand-new set of measuring cups puts the joy of baking back into your hands. 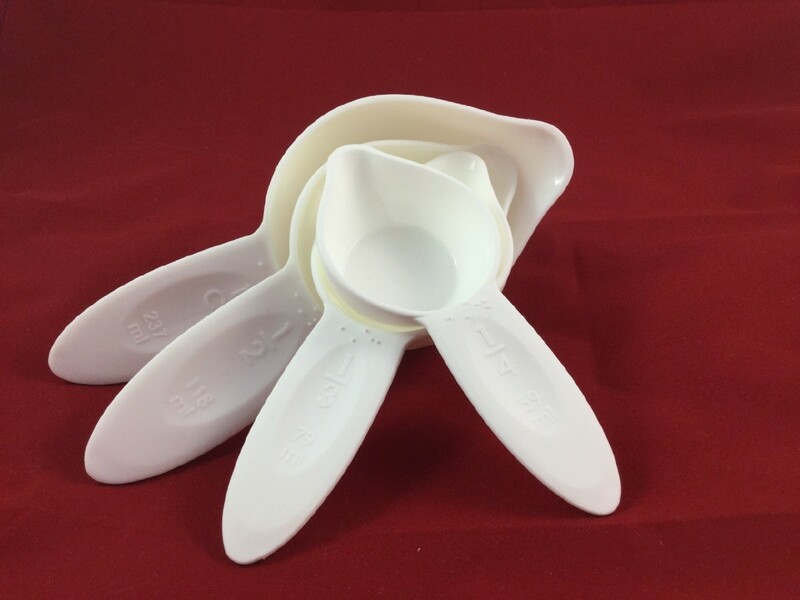 This nesting set of white, thick plastic scoops is not only extremely sturdy, but also dishwasher-safe. But it gets even better. All the larger cups have no-slip rubber rings on the bottom, so they won't slide around as you're filling them with milk or oil. There are no visual lines you need to worry about with these cups, just fill the scoop to the top - and pour. Each cup has an easy-pour spout, cutting down on the risk of spilling liquid as you bake. And, last but not least, you'll find a clear, embossed Braille marking on the handle of each cup, telling you exactly how much it holds. Your new set of scoops contains 1/4-cup, 1/3-cup, 1/2-cup, and 1-cup. So why not take the guesswork out of baking? Replace it with ease, simplicity, and peace of mind for years to come! Note: we also offer another set of helpful Brailled measuring gadgets for the kitchen. Our Braille Measuring Spoons (sold separately) really do go hand-in-hand with this set of measuring cups.